Detour. That way instead of the short and easy way. 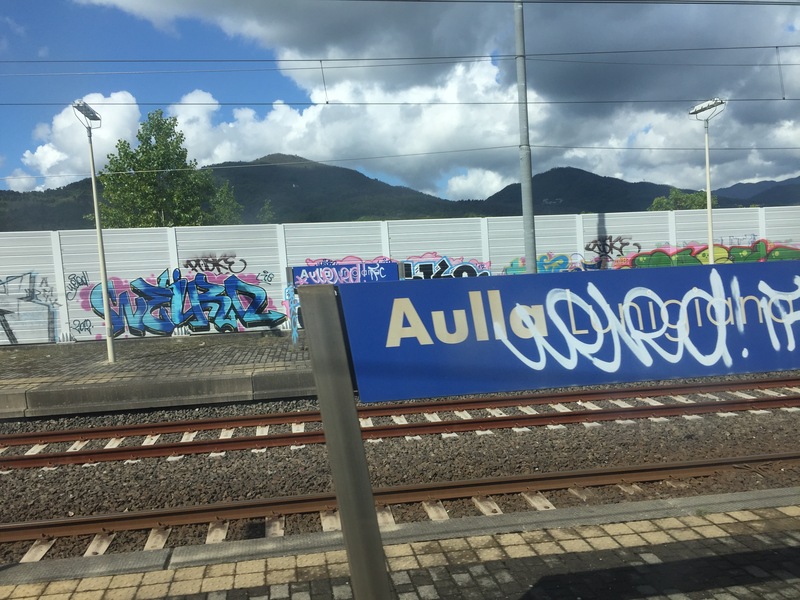 Every day in Italy I’m reminded of how my Italian language skills need improvement. Like last night at dinner when I was struggling to describe to the waiter exactly what I wanted. “Just tell me in English,” he said. In English. “I need to practice my Italian,” I said. In Italian. “You can practice tomorrow,” he said. In Italian. I think he regretted the joke a little, because by the end of the night he’d brought me two lovely glasses of chilled limoncello and had marked them on the check as offerta (complimentary). But I really am trying to learn this language, and I’ve decided I’ll set an achievable goal while here of learning — indelibly learning — one new word for the day. 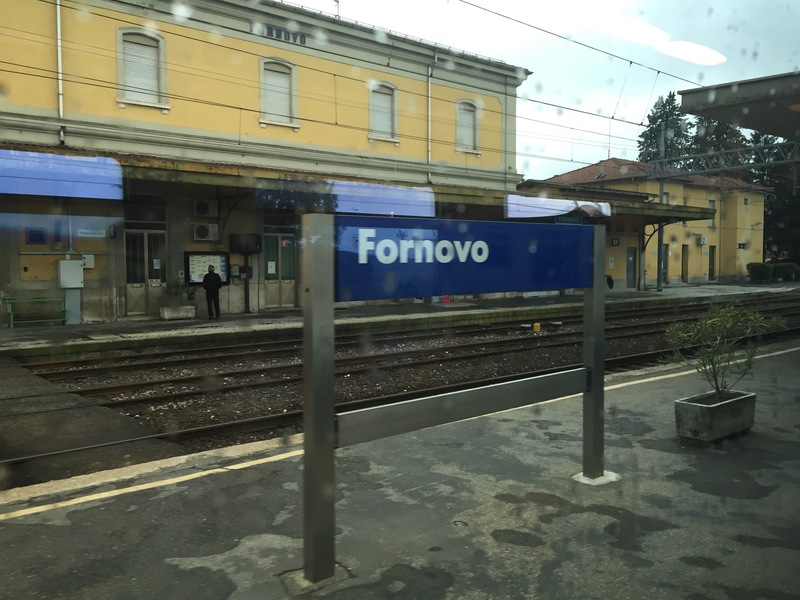 As I made my way from Parma via train to my new starting point, I learned invece from the station loudspeaker which announced, in Italian, that: “The train headed from Bergamo to Pisa will depart in three minutes from Line 1 invece di Line 5.” That set off a mad dash by about 20 panicked, prospective passengers down the steps from Line 5, through the tunnel and up the stairs to Line 1. This invece word seems downright powerful, I thought, as I ran right along with them. That was my train! In fact, the word seems to symbolize my entire day. 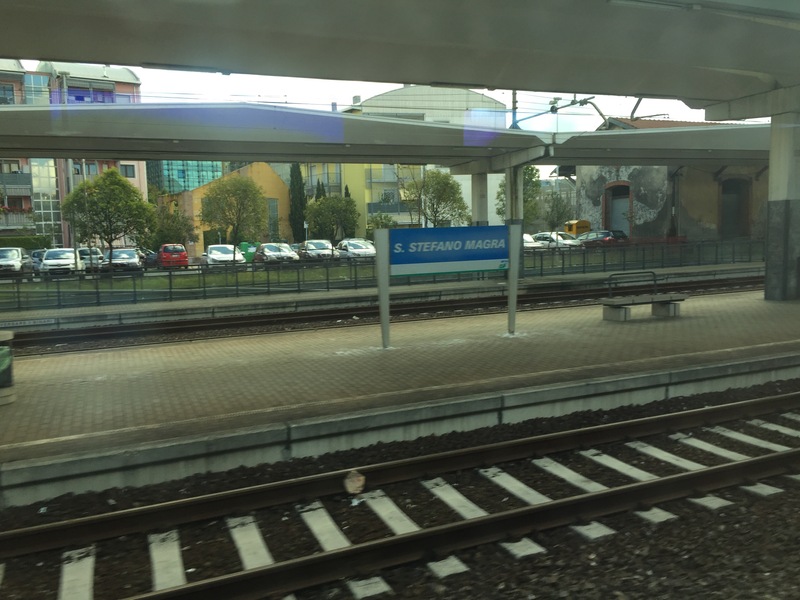 For starters, I was at the train station invece di walking because I hurt my foot two days ago. 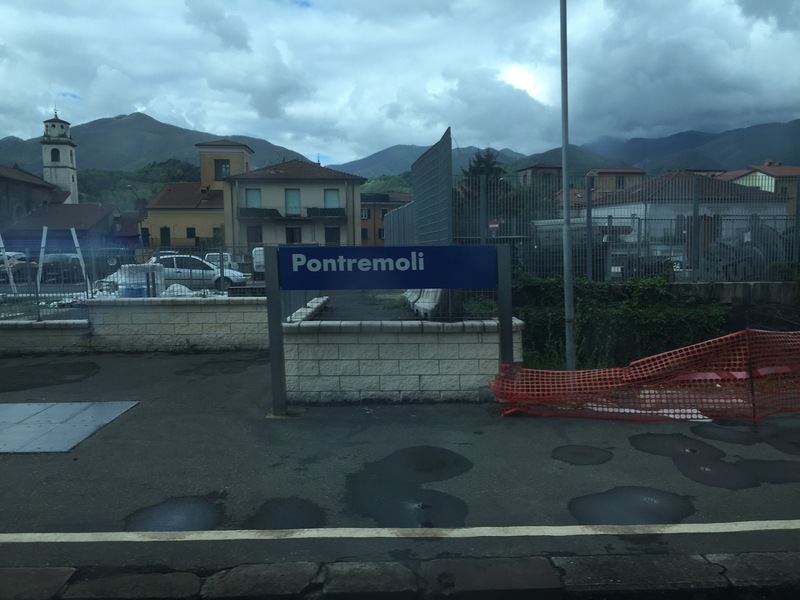 So now I’ve skipped ahead on the train, taking pictures of Via Francigena sites through the train window invece di outside in the fresh air. Invece is not all bad. 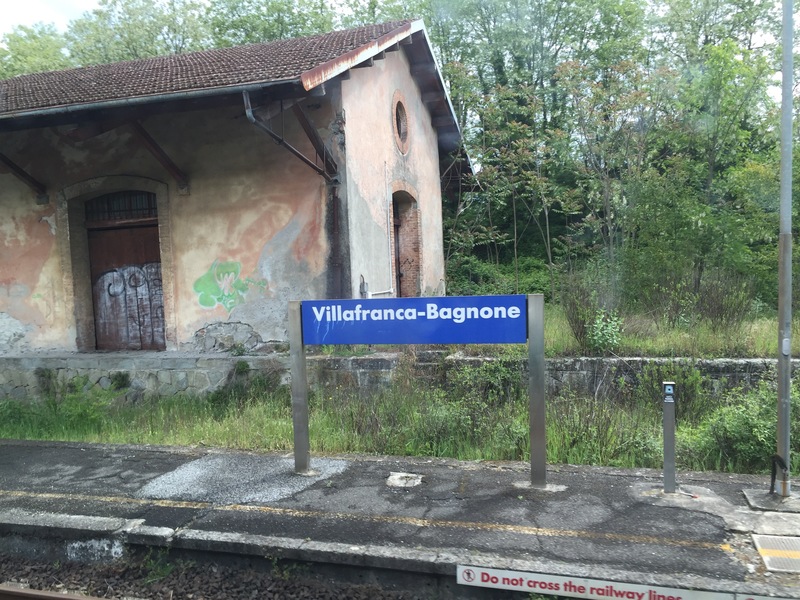 I did this part of the Via Francigena inside the warm and cozy train invece di outside in the cold and rain. Invece works with simple things: I used my external battery to give power to my iPhone on the train invece di the electrical socket, since those things never work on Italian trains. And sad and sentimental things: I’m missing my fiancée, Theresa Elliott, because I’m in Italy invece di back home. It works for things geographical: by the end of today’s walk I’ll be in the region of Tuscany invece di Emilia-Romanga or Liguria. And things fun and laughable: I was almost late to the train in Parma today because I was watching video of the President’s comedy routine at the White House Press Corps dinner invece di packing up my stuff. It works for things relational: I met other pilgrims in Sarzana –Dutch and Italian! — so I’m making friends invece di being alone. Pilgrim pals Paolo, Aura and Merike. aand family invece di everyone we’d like to invite to our big day. And obligational: I’m under a little pressure to wrap up this walk in May invece di extending into June because we’ve promised friends we’ll enjoy Memorial Day Weekend with them. For things adversarial: I snapped at two of my sisters in emails this morning invece di being patient and long-suffering. And things itinerarial: by the end of the day I’d walked 17km (10.6 miles) from Sarzana to Avenza on both feet invece di giving up this walk due to a bad foot. Invece di walking to Fornovo. 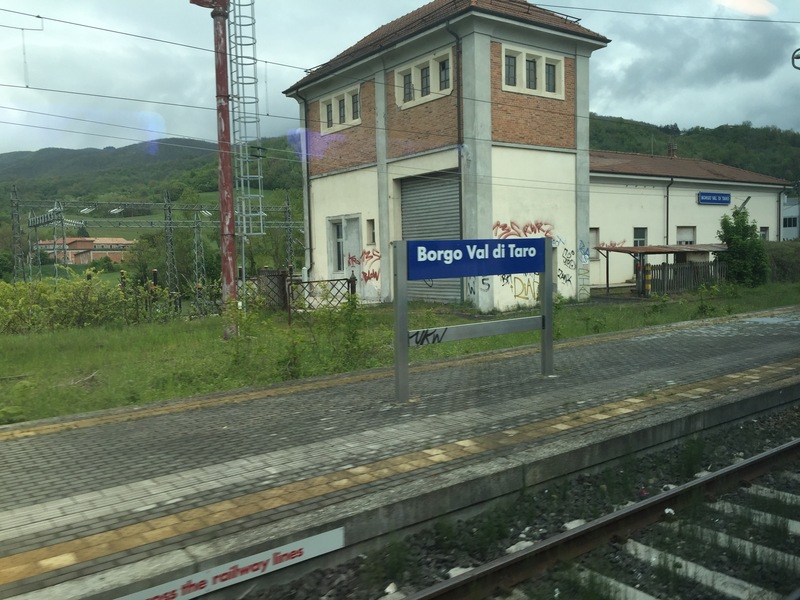 Invece di walking to Borgo Valle di Taro. Invece di walking to Pontremoli. Invece di walking to Villafranca-Bognone. Invece di walking to Aulla. Invece di walking to San Stefano Magra. 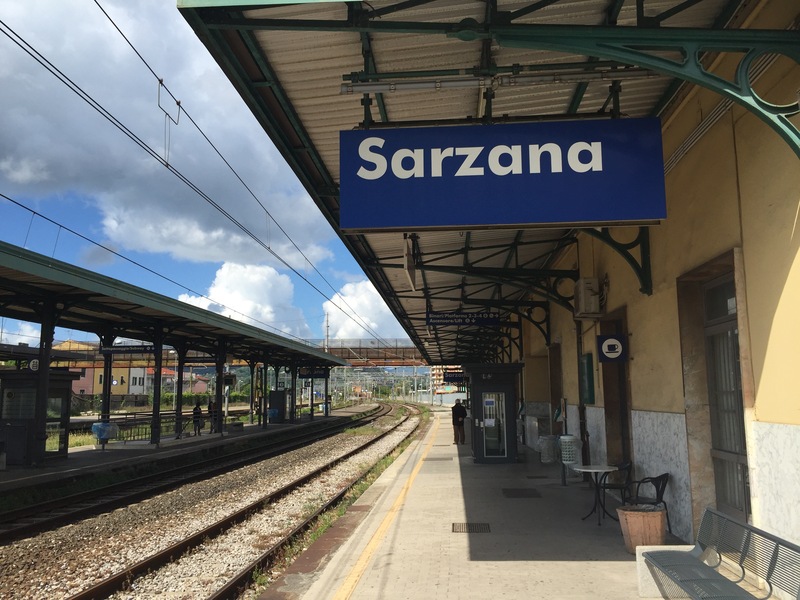 Invece di walking to Sarzana. And with that, I’m fresh out of invece tricks. It’s an important word really, all about choices and changes. It’s a pivot word, implying a before and after, something left behind with something new to be welcomed. 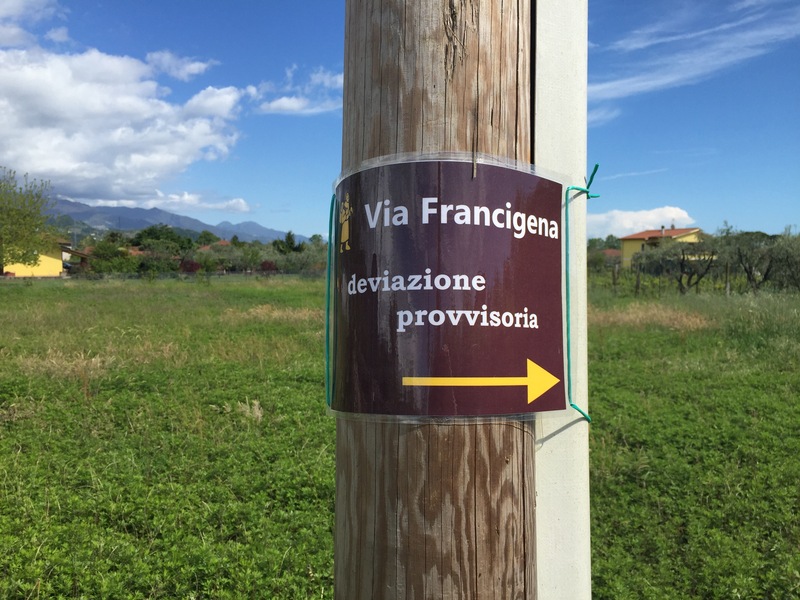 So I’m welcoming this new phase of my Via Francigena in which I’ve merrily skipped ahead instead of grinding out each successive kilometer on foot. Arriving, on foot once again, at the Ligurian Sea, I welcome the beach and the salty smell of the air and the flat terrain and the palms among olive trees and everything that’s so new and different about these few days along the coast. And I’m glad my foot held up invece di having to head home early. 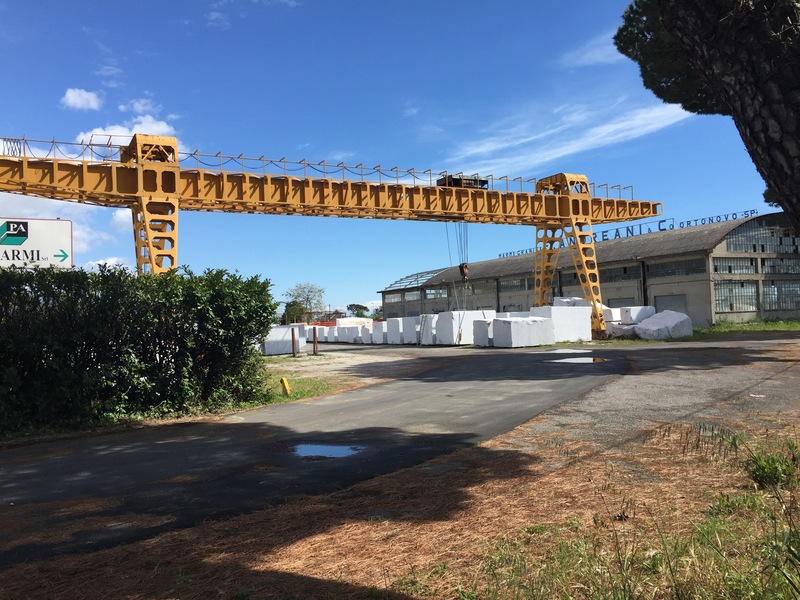 Avanza is between the town of Carrara and the Port of Carrara. Here mountains are sliced into crisp white chunks and sent all around the world. P.S. As the day wore on my foot got stronger and less painful. Amazing. 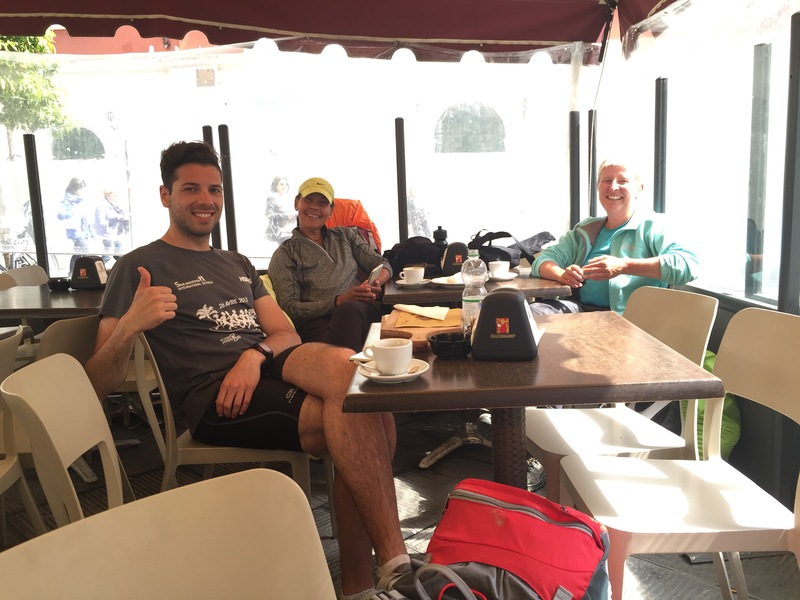 This entry was posted in Via Francigena 2016 by SandyBrown. Bookmark the permalink. Me alegro que sigas adelante en vez de (invece) terminando tu cammino! Adelante Fratello! Domani e un giorno nuovo!